Welcome to Lamplight Carriage House! The antique door is one to be admired with its brass nob and curved window. View from the stairs. 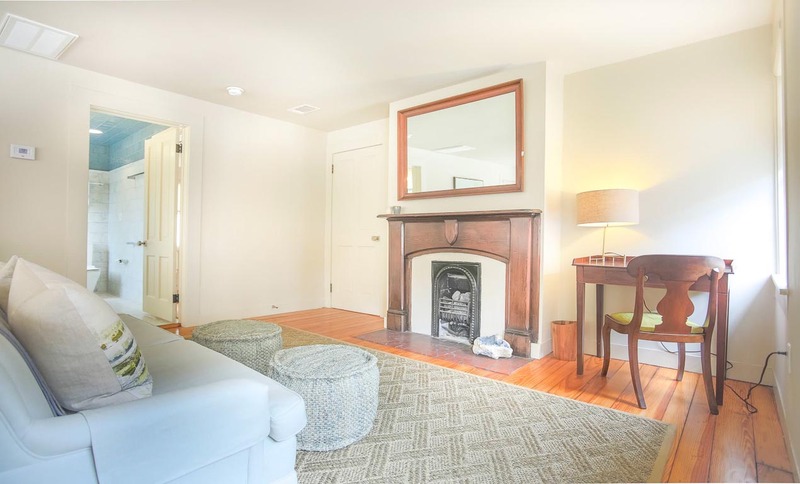 The mirror above the fireplace turns into a television! View from the living room. A little nook to read a cook book! 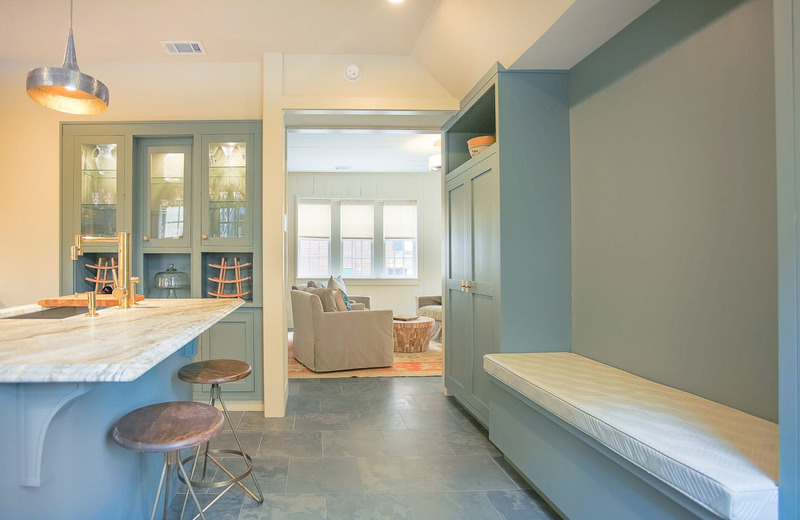 Enjoy a quick home cooked meal at the breakfast bar. Unique and modern sophistication. The recently updated kitchen is fully stocked for all your cooking needs. The refrigerator and freezer are tucked away in the cabinets. 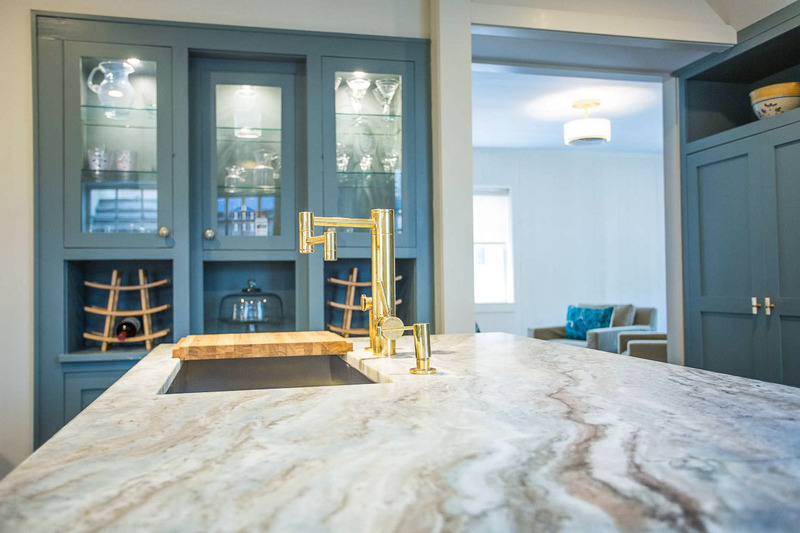 Hand picked carrera marble stretches over the large island. Come on in to the master bedroom. Put up your feet and start that book you've been wanting to read. The master bedroom is open and spacious. Need to get some work done? This antique writing desk awaits. The accent fireplace creates a warmth and coziness. The bathroom is just off the sitting area. Start and end your day in luxury. Take a long soak in the luxurious tub. This jack and jill bathroom is shared by the master as well. Neatly tucked away is a stackable washer and dryer. Closets for hanging and drawers for folding on both sides of the bed. 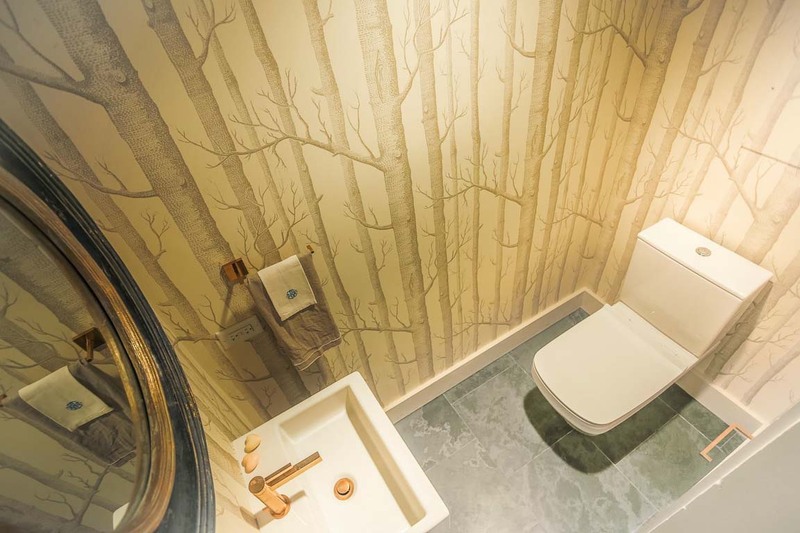 Classy wall paper and a large mirror bring this half bathroom to life. The doorway to your home away from home. 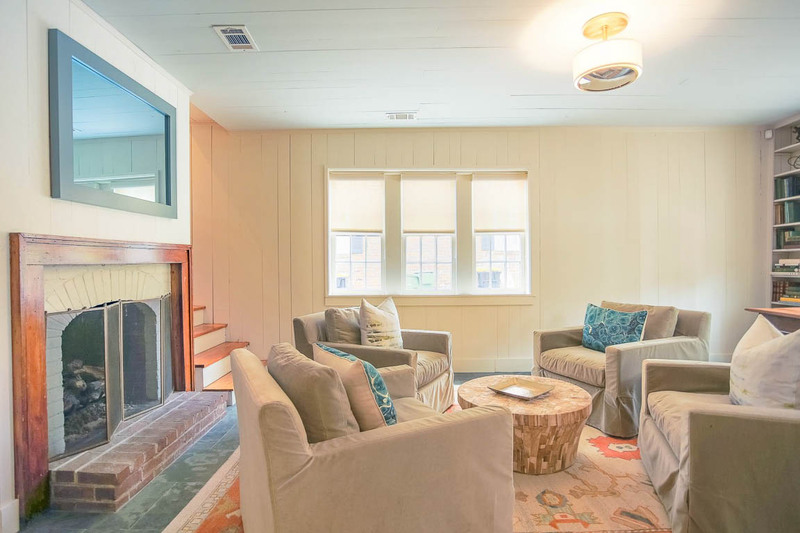 Located on the corner of Charlton and Lincoln in Historic Savannah, the newly renovated Lamplight Carriage House is a lovely mix of old and new. 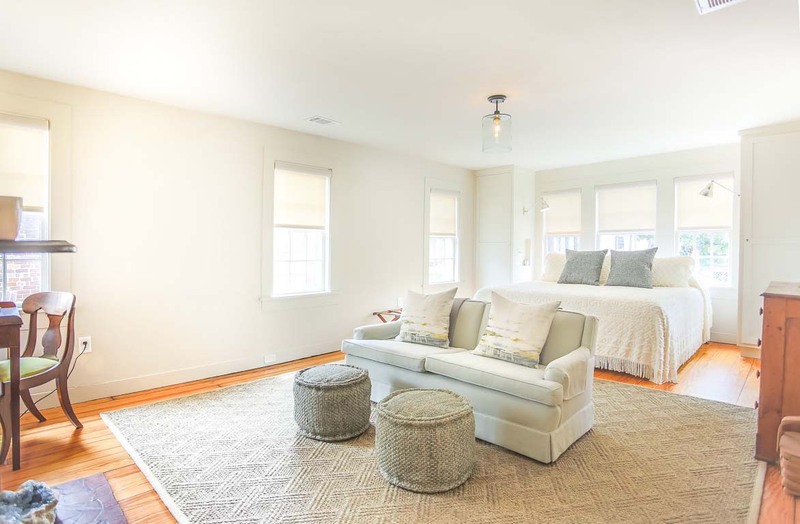 Built in 1855 for Charles Lampe just across the courtyard from his main house, Lamplight is perfectly situated in a quiet ward within easy walking distance of restaurants, shops and sightseeing. Accessing Lamplight through its private brick courtyard, entry is gained through its restored 3” thick period door. Handsome slate tile floors throughout the ground floor perfectly complement the new décor. The living area offers ample seating as well as a place to view entertainment in the comfort of brushed velvet swivel chairs - the mirror above the fireplace is also a smart television. An antique dining table with seating for four anchors the room. In the nearby kitchen, light flows through double windows, creating a warm and inviting atmosphere. All modern conveniences are incorporated into this luxury space, including a Nespresso coffee machine with complimentary pods. Under-counter refrigerator and freezer drawers, dishwasher, toaster, microwave, electric kettle and frother, and waffle iron are neatly concealed yet at your fingertips. Two can sit at the beautiful marble island for a casual meal or to keep the cook company. 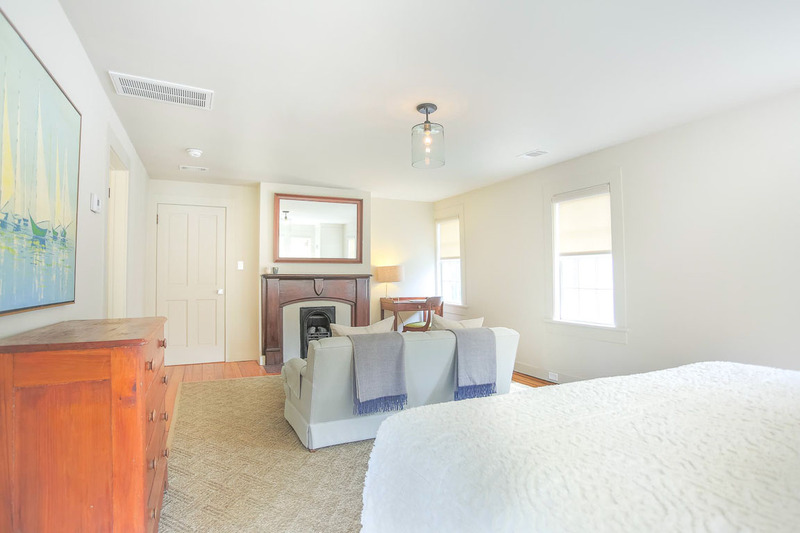 Above the main floor is the King master bedroom, complemented with an antique writing desk, pine chest of drawers, dual closets and a soft, linen loveseat. 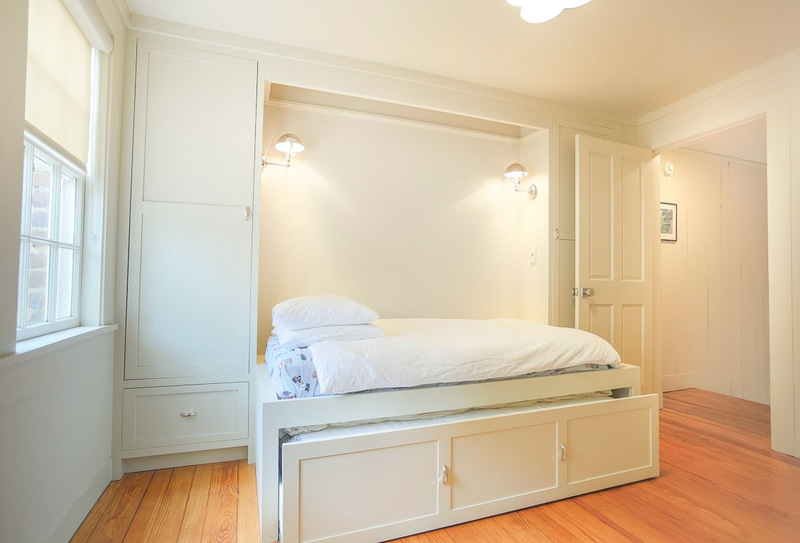 A nearby smaller bedroom offers a twin bed with a trundle twin below that can convert to a second King. 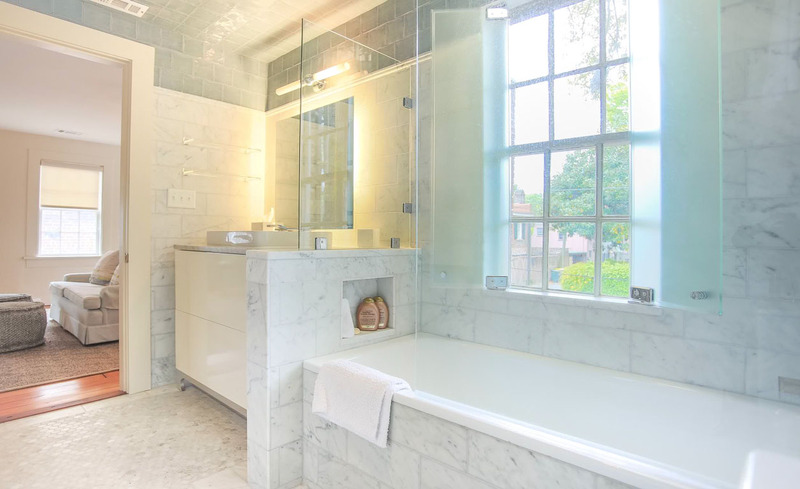 Off both bedrooms is a spectacular, well-lit marble bathroom featuring a waterfall shower/tub combination, beautiful fixtures and ample storage. Within walking distance of this stylish carriage house are many local attractions including the marvel of the recently restored Cathedral of St. John the Baptist, the famed Mercer-Williams House of the book Midnight in the Garden of Good and Evil, the long-established Mrs. Wilkes' Boarding House, and southern author Flannery O'Connor’s childhood home. Vast shopping found on Broughton Street and in the boutiques on Whitaker Street are also within easy reach. 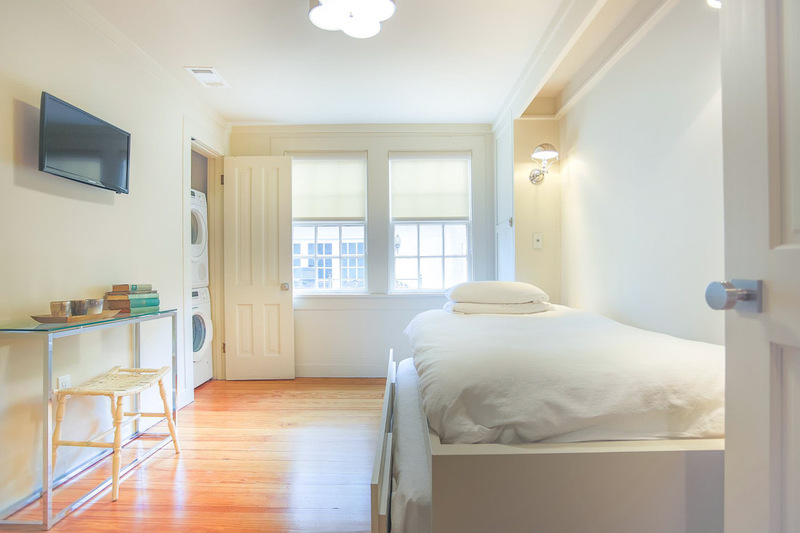 - Neatly tucked away in the guest bedroom is a stackable washer and dryer. 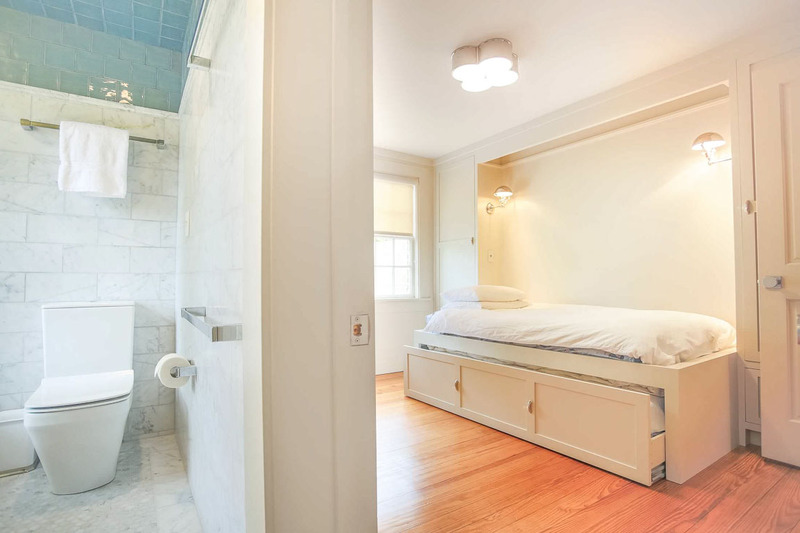 - The waterfall tub is the perfect way to relax after a long day exploring the city. amenities this guesthouse has to offer! near the home, even on the busiest of weekends. We loved our stay at the Lamplight Carriage Hosue ! The home was spotless - charming - and in a perfect location! Your 100 ft from Jones St - one of the prettiest streets in Savannah! Lovely property within walking distance to everything in historic area. Looks just like it's pictures! Clean, high-end appliances, comfy beds - we began calling it "home" early on in the stay. Everyone was very nice Lucky Savannah too. (Thank you!) Outside door lock is a little tough and always use the gate's interior lock (Through the gate from outside) to lock it because the exterior lock is tricky. Loved this place and highly recommend it. Great for small family or two guests. We had a wonderful experience staying at the Lamplight Carriage House. It was so very well appointed, the fixtures throughout the home were beautiful. The shower was a bit difficult to use as the shower head pours water directly over the drain- I was constantly stepping on it, causing the water to back up in the tub. Also, there was a French press but not a standard coffee maker which was a mega bummer for this coffee lover! We walked or caught an Uber everywhere we went and the location was excellent. There is a little cafe around the corner by the Cathedral that we frequented as well as several historical spots any visitor would want to see. Super great experience! Great rental and great location! Very satisifed with this rental. 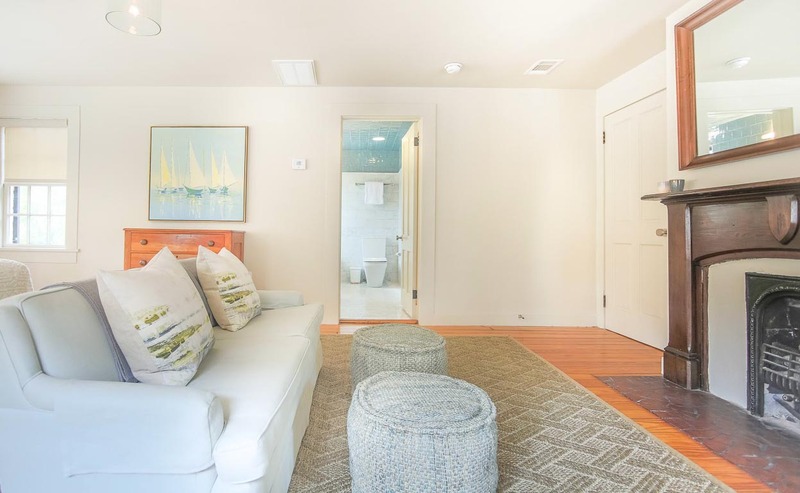 Perfect location halfway between Forsyth Park and waterfront. Property was clean and well-stocked. Good support from Lucky Savannah, who were always checking in to see if we needed anything. If there was anything lacking, it would be an outdoor space, either a garden seating area or porch. Otherwise, a great place to stay. While our stay got off to a rough start due to the unit not cooling down, once it did cool off by the next day, it was perfect. The size and location were just great... You may need to work on those rusty gates, they were a little hard to open/close. But it was beautiful inside and so comfy once it cooled down. Thanks for the prompt attention! This rental was even nicer in person! Had everything we needed and was in a great location. We walked almost everywhere for our stay and it was such a pleasure to come back to this house rather than a hotel! The only con, which others had mentioned, was the finicckyness of the gate. It was very difficult to open and close. We eventually got the hang of it, but aside from that we had no complaints. Would stay here again! We enjoyed our stay at the Carriage House. The lock on the door was a challenge, but we actually got pretty good at opening it. We only moved our car once to visit Tybee Island, we walked everywhere. My wife and I spent eight nights in the Carriage House in our first time visit in Savannah. The location (in the SE part of the historic district) for the price is really good. You are literally 1.5 blocks from two squares and minutes from many others. Restaurants, cafes, coffee shops and other shopping are in abundance, many within a few minutes (Clary's Cafe and Mirabelle Cafe were minutes-away favorites), with the farthest a 20 minute walk. So, we rarely had to use our car while there. We even walked the half mile south to the Kroger for groceries. We were able to park free in front or within a block of the house the whole time there. The Carriage House itself was as beautiful as portrayed in the pictures. It was so fun to be in such a historic structure beautifully decorated and still have all the modern creature comforts. The kitchen was well-stocked with all needed pots, pans and utensils. The king bed was comfortable. The bathrooms were great. As a techie, I was glad to have fast WiFi (65meg download). The few downsides - If you are a light sleeper, you might want to bring ear plugs, as outside sounds penetrate the historic structure pretty well. Also, the living room TV was missing. There is a TV in the 2nd BR upstairs with basic cable and a Roku box. The Lamplight was a cute place to stay and we enjoyed it a lot. I'm thankful that there was a maintenance guy around when we pulled up on the first day or we would never have been able to find the place or open the main door. My only 2 complaints is no regular easy coffee pot in house and the front door is very hard to lock. Great First Visit to Savannah! We stayed here for an anniversary trip and the Carriage House is just as it looks in the pictures. Everyone mentioned the door/gate but it was pretty easy after the first try. This unit had everything we needed and the location was great. Just close enough to walk to where the action is, while also being in a quieter area with less foot traffic. Always found a parking sport right out front. We only had one hiccup with the TV, but the property management company was very responsive and remedied the situation immediately. Would definitely recommend this property and the management! Cozy surroundings. Well equipped except no TV in the living room. Suggestions would be add a DVD player, broom, kitchen towels and ceiling fan in the master bedroom. Great location. The property was lovely and we had a wonderful time. An excellent location that enabled us to walk everywhere we wanted to go. 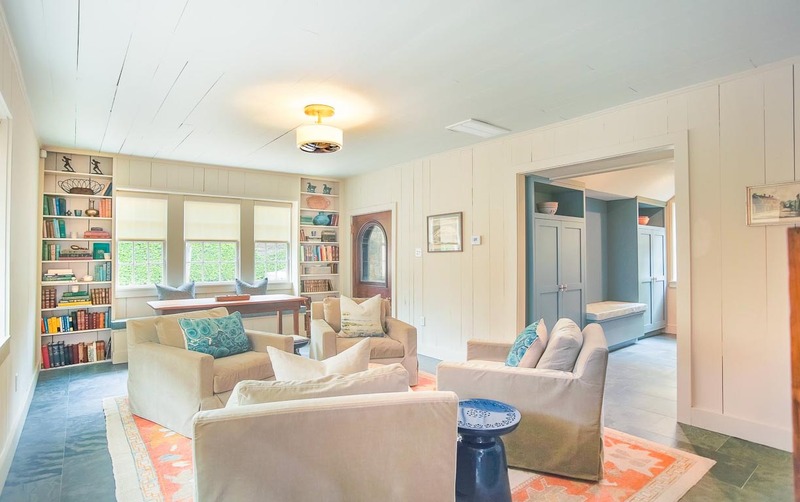 This was one of the most beautifully appointed vacation rentals we ever stayed in. High end appliances and beautiful furniture. Cons: our WiFi didn’t work for 2 days (info listed was incorrect. When we contacted the rental co. The 2nd day they gave us another password username which also didn’t work. They did come by on third day with a hotspot. Also it’s a little tricky getting into lockbox, gate and front door. Hi Sandra! Thank you for choosing Lucky Savannah to host you in the Hostess City of the South! We're so glad to see you enjoyed the decor of your rental. Also, thank you for allowing us to rectify your issue with your WiFi connection. Our 24/7 Guest Line is always available to assist. We hope to see you again soon! The Lamplight Carriage House was very nice. Kitchen is awesome, the place is nicely decorated. The only annoyance was the door key to get in and out of the house. The door needs to be adjusted so that the deadbolt lines up with the deadbolt face plate. It was quite difficult locking the door. The place was clean except under the master bedroom bed which looked like it has never been cleaned under. This would be easy to rectify by getting the housekeeping service to include this when cleaning the place after each guests visit. Nice little place to stay! Nice place to stay. Although I will say the kitchen floors were sticky, so perhaps hadn't been cleaned in a while. Also, the bathtub is quite high, so be careful if you're older (like me) getting in and out. Overall though, we enjoyed our stay. We met for a weekend with friends I had not seen in years. We ended up just all staying in the master bedroom and used the couch there for an extra bed. There was another room with a twin bed in it, but we wanted to all be together. Everything was very nice and true to the photos. It took us a bit to realize that the fridge was in the drawers in the kitchen, the mirror in the living room was 2 way so that you could watch a TV through it, and the shower took us a little while too. We are not fancy, but this place definitely was. Perfect for a Girls only retreat. Walking distance to everything, great parking, makes this a perfect place. Fascinating and crazy! 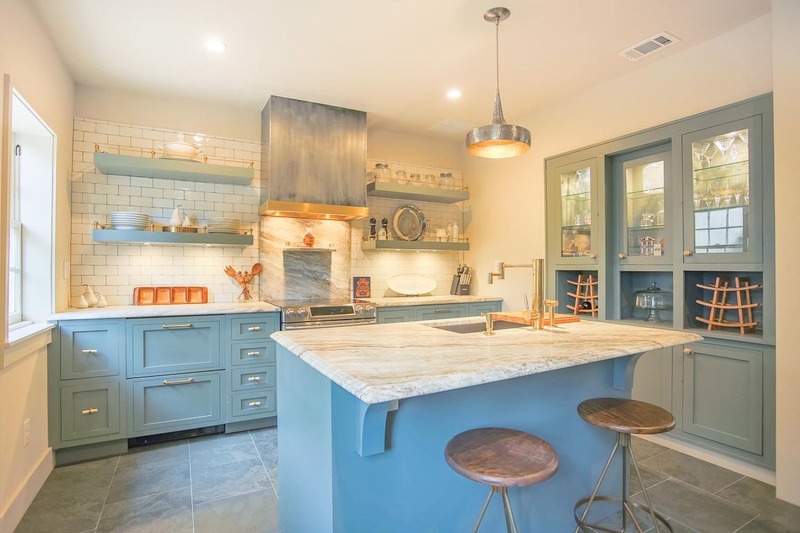 Lovely remodel with cool touches! We didn't know a tv was downstairs, it looks like a mirror! The powder room in need of soap and a door handle, some outdoor sitting would have been nice! Also, very disappointed it was advertised as having internet we needed for work, no access found! The carriage house was a perfect place to stay for our mother - daughter getaway. Location was an easy walk to groceries, dining and DOT bus stops to more distant locations. The finishes in the home give a relaxing feel that make it easy to call this place your home away from home. We did run into an issue with water pooling in the corner of the shower and leaking down into the kitchen along with some dripping from the ceiling during a very hard downpour. Things to be expected in older homes but we did make the rental company aware and hopefully these things were immediately fixed. Great Location, Convenient to everything in Historic Savannah! The location of this property is excellent. We were able to walk to everything and leave the car parked; we did have to move the car (still very close to the house) a couple of times to avoid the street sweeper schedule. The house was just as pictured, neat and clean, but could use a deep clean for things like under the bed, the air/heat vent, grout. We are used to quiet at night and travel with ear plugs as a rule, which we found we needed. The house sits to the rear of the main house, however, it is on a corner so the carriage house is right on the street. The bed is literally 20 feet from the sidewalk below, and the other wall of the bedroom faces the alley behind the house. There was some traffic noise early in the night, although not bad, and a few neighbors standing in the alley talking one night having drinks. Sleeping masks were provided by the owner, but didn't really need them as the shades blocked most light. Once the earplugs were in and the mask on, we slept really well in the comfy King size bed. Towels were provided, but only one handtowel, so we did a load of laundry while there and was not a problem. As others have mentioned, opening the front door takes a little getting used to and is definetly a two hand task. The door is an antique and is beautiful, but cold air blows in around it. The home is beautifully finished, and the Nespresso machine was fun to try. We enjoyed our stay very much in Savannah and would recommend this property to others. We are looking forward to returning to Lamplight Carriage House. Hi Kimberly! Thank you for choosing Lucky Savannah! We're so glad you enjoyed your rental and location! Also, thank you for giving us feedback on areas to improve. This is what allows us to provide the best service and accommodations to you. We hope to see you again soon! Our stay was fabulous. It was in a perfect location. Easy walking to everything. We want to come back and stay again. Real nice vacation home. It‘s a perfect base to explore Savannah. We enjoyed our stay very much. This was a great place. The owners/managers were so thoughtful in every way with the house. Pump hand soaps, shades for the windows, fully stocked kitchen... You would think: hmm, I wish it had... and then turn around and it was there! The only downside was that for two young women traveling alone, there were some slight worries for safety. The area was not 100% free from sketchy passersby, which was a shame because a street over it was a totally different story. I think it is because there is a semi-abandoned building across the street, and for some reason in Savannah, that seems to attract a certain crowd. I did like that there was a gate - that helped. Still, there were a few times I laid down a little uncomfortably. Thank you, though, to the owner/managers for a completely professional job, and an extra night half price! Fantastic home! Clean, well appointed! High end furnishings and finishes! Thanks for putting window treatments in the bedroom!! Very peaceful yet close to everything! The carriage house was very clean. looks like the owners/mgmt put a lot of thought into the lay out and amenities, and the location was very convenient. Only drawback for us was the TV's the one downstairs didn't work and the other was in an awkward rm. The main house rear entrance was a little unsettling with boarded up doors and holes in the walls & unkept garden area. We loved our stay at this home! The house is beautifully decorated and in a great location that allows you to easily walk all over Savannah. We did have a car during our stay and never had a problem finding street parking. As others have mentioned, the locks were slightly challenging to work with at first, but we got the hang of it quickly. Just part of the charm of this historic home! This was the third home we have rented through Lucky Savannah, we have always had a great experience! Highly recommend! This place has character! Romance was in the air! We celebrated our 17th anniversary together. Everything we needed was available. Clean place, quiet area , and everything was in walking distance. A definite plus also was that it was affordable. We would love to come back again! I loved our stay in Savannah. The carriage house was a great location for us. It was away from all of the action and noise but close enough to walk to everything. The house was clean and updated. The only issue we had was construction right behind our house so in the mornings we were woken up by that but overall it was a great stay. The rental company was also very helpful. I would definitely recommend this carriage house! Hi Vanessa! Thank you so much again for choosing to stay with us. We're so glad to hear you enjoyed Lamplight Carriage House and that our staff was helpful. Please know that you're privy to our Friends and Family discount next time you stay with us. Looking forward to hosting you again soon! We had a fantastic time at the Lamplight Carriage House. It was beautifully renovated and had everything we needed for a wonderful 3-night stay: great kitchen, comfortable beds, and roomy living spaces. The location was perfect for walking to both the north and south side of the Historic District, yet being in a pretty residential, local area. We had the privilege of meeting the very gracious and warm owner--an added treat. We would most definitely stay at Lamplight Carriage House again. Hi Cindy! Thank you so much again for choosing to stay with us. We're so glad to hear you enjoyed Lamplight Carriage House and our beautiful city. Please know that you're privy to our Friends and Family discount next time you stay with us. Looking forward to hosting you again soon! The property was exactly as described, very well maintained. We loved the location, near the edge of beautiful historic properties but still within walking distance to everything downtown. Our favorite restaurant was The Public Kitchen and Bar, very close to the rental! I would stay here again - this was one of the best vacations I've ever had. Loved our stay in Savannah! We absolutely LOVED our stay in Savannah! This property looks exactly as it does in pictures. 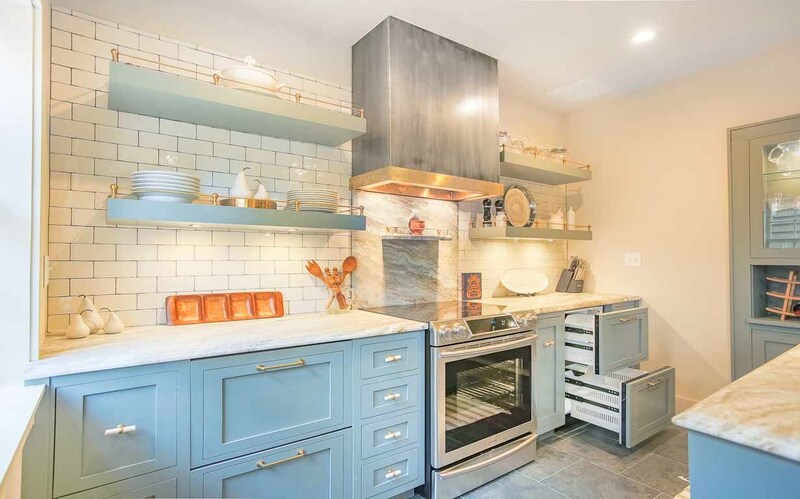 The kitchen is an absolute dream and looks like it could be the set of a cooking show. It was nicely stocked with everything we needed. The AC worked really well which was a nice break from the late September heat. The location is great; walking distance to both the downtown/shopping area and Forsyth Park. It's right around the corner from the famous Cathedral and a cute coffee shop (Mirabelle Cafe). The quiet street is nice and parking was never an issue (just be careful of street sweeper signs). You really don't need a car unless you want to travel outside of Savannah. My only complaint is that the gate situation is TOUGH! Unlocking & locking the gate as well as the front door was really difficult (even for 3 strong and capable 30 yr old girls). The gate and locks are very old and it takes some strength and patience to get in or out of the property. If this was updated, then the property would be 100% PERFECT! With that being said, I would definitely recommend this property and stay there again. Places you shouldn't miss - The Olde Pink House, LEOPOLDS!! !, Beetnix, Zunzi's, bike tour with Savannah Bike Tours. Hi Megahn! Thank you so much again for choosing to stay with us. We're so glad to hear you enjoyed Lamplight Carriage House and that you got to experience some of our favorite local spots. Please know that you're privy to our Friends and Family discount next time you stay with us. Looking forward to hosting you again soon! Pros: Jennifer with Lucky Rentals was great and the process was seamless. The house was beautifully updated and had everything that we needed through our stay. The location was great and in walking distance to everything we wanted to see or do. It is in a "local" area and we loved that. We never had an issue with street parking and it was not metered so we did not need the day pass. We loved our stay! Cons: The windows are old and you can hear everything outside as if it was happening inside the house. Because the windows are thin the AC struggles to keep up with the house. It was 100+ when we were there and the downstairs never got cooler than about 75 and the upstairs stayed around 78-80. But, with the heat we experienced, anything was great. When you check in the gate is the second gate down Lincoln - both gates have lockboxes. My husband and I stayed at this property for four nights. We chose this place based on the pictures but nothing could have prepared us for how much we would love it! I wouldn't change a thing about this beautiful little home. It is even better than the pictures! It is cozy, charming and quintessential Savannah. We loved it and highly recommend it to anyone looking for a romantic, beautiful escape! One thing though, there is a street lamp near the master bedroom window. If you are sensitive to light while trying to sleep bring a sleep mask. Hi Alyssa! Thank you so much again for choosing to stay with us. We're so glad to hear you enjoyed Lamplight Carriage House and that is exceeded your expectations. Looking forward to hosting you again soon! Spent the weekend with my wife here to celebrate our wedding anniversary. The rental was just as depicted in the pictures. Nicely renovated throughout. My wife and I loved the kitchen, which was stocked with all the necessities. The master bedroom was huge and the bed was extremely comfortable. The AC was not working properly when we arrived, however our concern to management was answered quickly, maintenance was out within an hour, and the property was properly cooled when we returned from dinner. We really appreciated how quickly they took care of our issue. The unit is located within a short walk to all the shops, restaurants and bars the historic district has to offer. This was our first time to Savannah, we loved the city and loved this rental. I definitely recommend this property. We will be back and plan to stay at the Lamplight Carriage House again! Hi Stephen! Thank you so much again for choosing to stay with us. We're so glad to hear you enjoyed Lamplight Carriage House and look forward to hosting you again soon! Our Savannah hideaway in the heart of the historic district. We loved our stay at our cozy carriage house. The kitchen is a dream (except for not having a small kitchen table or a coffee maker). Also wished there was a blind on the kitchen windows facing the house across the courtyard. Everything was first class from the appliances to the décor. The bed was very comfortable, Gorgeous tiled bathroom. The only issues were trouble with closing the outside gate, and we wished there were heavier blinds and/or curtains in the bedroom. It was bright in there very early even though luckily the windows weren't facing east. Overall though, we loved it and would stay there again. Hi Jeffrey! Thank you so much again for choosing to stay with us. We're so glad to hear you enjoyed Lamplight Carriage House and have made note of your suggestions. Please know that you're privy to our Friends and Family discount next time you stay with us. Looking forward to hosting you again soon! Perfect location. Easy parking, never needed my car. Very manageable walks to market and all historic areas. The accommodations were very nice and roomy. Thank you for staying with us, Christopher! Location ideal if you want to walk through Savannah. Carriage house a gem. Fabeautifully furnished And easy parking. Hi Pamla! Thanks so much for staying at Lamplight Carriage House. We look forward to hosting you again soon. Carriage house was lovely and just enough space for my husband and I along with our 2 college age kids. Beautifully decorated and location was perfect for the weekend and Easter Sunday mass at St. John's. Could not have asked for more! Thank you so much for staying with us, Lisa! We look forward to your return. We'll be returning to Savannah. One trip wasn't enough!! Our trip to Savannah was taken when the Magnolia trees were beginning to bloom and weather was perfect. The Carriage House is beautiful and within close walking distance to everything we planned on seeing in the Historic District. The places that were too far for walking wasn't a problem since the Trolley has planned stops throughout. Hi Meri! Thank you again for staying at Lamplight Carriage House. We're so happy to hear that you enjoyed your time in our beautiful city! Looking forward to hosting you again soon. 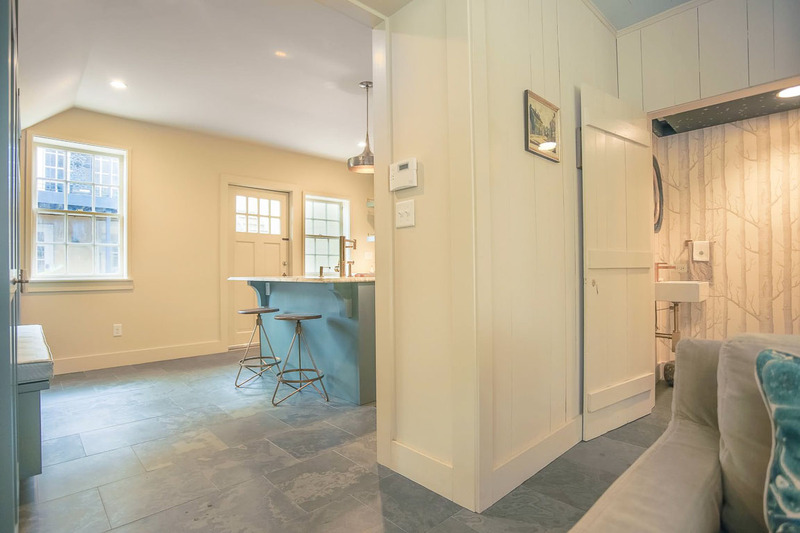 This carriage house is stylish, well-appointed and tucked away in a convenient, but off-the-beaten-path location. 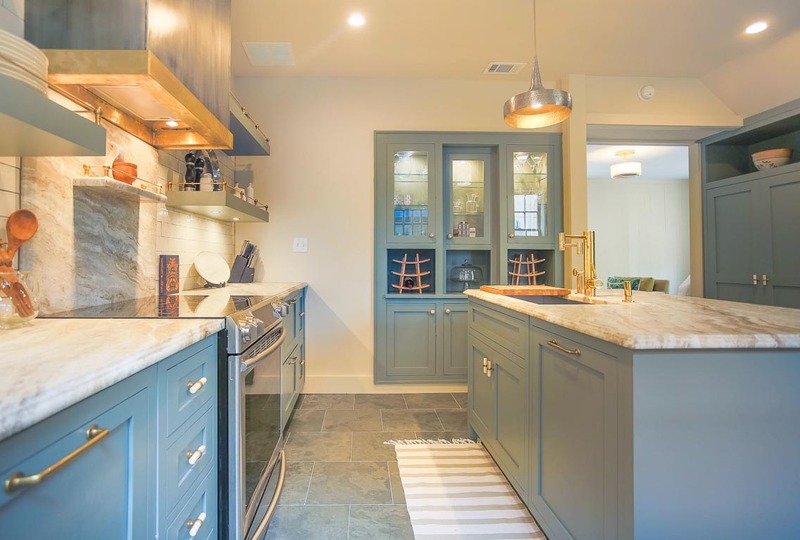 As a professional residential interior designer, I especially appreciated the attention to design and detail, as well as some upgraded kitchen amenities. Highly recommend! Thank you for staying with us, Andrea! Your comments on the decor and amenities are very much appreciated. The place looks just like the pictures and has everything you could need. Beds were great, chairs were comfy, hot water and water presser in the shower was great. The extra 1/2 bath was great. We didn't do any cooking, but the place seemed to have what you would need to have a nice meal there. The place was in a great location. Just a blocks from good food, the big park, and a Kroger. Now for the super picky "issues" that in no way spoiled my vacation personally, but I found them strange. There are no black out shades in the bedrooms and there is a street light right outside. If you need it dark to sleep, bring a sleep mask. Also, there are no fans at all in the whole place, so you may want to bring a small one if you like fans (as I do). The 1/2 bath doesn't have a door that latches shut. It was a little strange, but it added to the "outhouse" feel of the decor in that bathroom. The gate to get into the courtyard takes a good pull/push to get open. I didn't see a normal coffee maker, but we don't drink coffee so maybe I did see it and didn't realize I was looking at a coffee maker. There was however a Nepresso(? )machine and pods for it provided. I would for sure stay here again! Thank you for the kind words and specific feedback, Jerrica! We're so appreciate of your suggestions and will pass them along to the appropriate parties. Please know you're privy to a Return Guest Discount next time you stay with us. WE loved the carriage house. But a few things we feel really need attending to. 1) Curtains in the master bedroom. There are shades but street lights peer in at night. Other's have commented on this as well. 2) Additional locks on the doors, such as chains. With keys being shared, we felt it would be important to be able to chain the door at night.3)A coffee pot. Not everyone wants espresso. The owner obviously spends a lot on this place it really is true to the pictures - not sure why these items haven't been addressed. She has great taste and beautiful things. The place is within walking distance from all the great stuff. We would absolutely stay there again if these items were addressed. So I hope the changes are made because we want to come back! Hi Laurie! Thank you again for choosing to stay at Lamplight. We're so happy to hear that you had a fun trip and are very grateful for your constructive feedback! Please know you're privy to a Return Guest Discount next time you're in town. Lamplight Carriage House! Excellent,walkable location. The home was beautiful. I loved the decor and the front door. I had no issues over my stay. The place was clean, comfortable and felt secure. I thought Lucky Savannah was great and appreciated the information they sent on restaurants, tours, etc. I took a photography tour with Capturing Savannah that I would highly recommend. Hope to be back. So glad to hear that you enjoyed your time in Savannah, Mollie! Looking forward to hosting you again soon. We had a wonderful time while staying in the carriage house. The place is beautifully decorated, walking distance from every main attraction in Savannah. 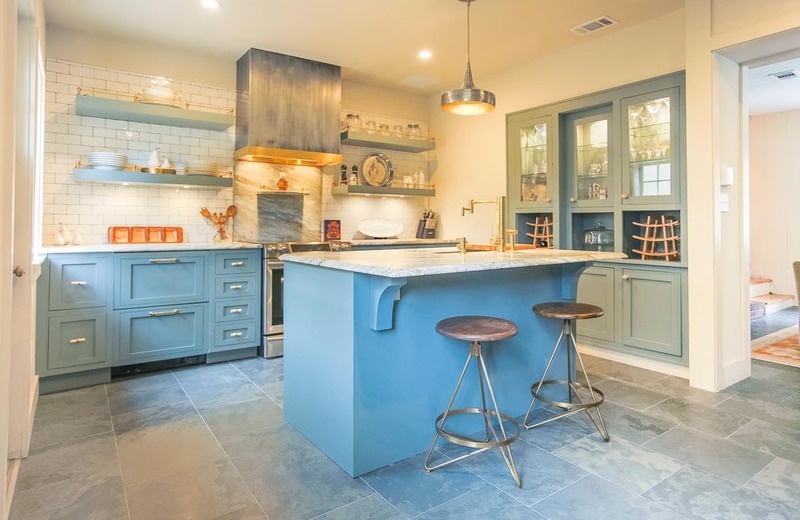 The kitchen is fully remodeled with modern accents. 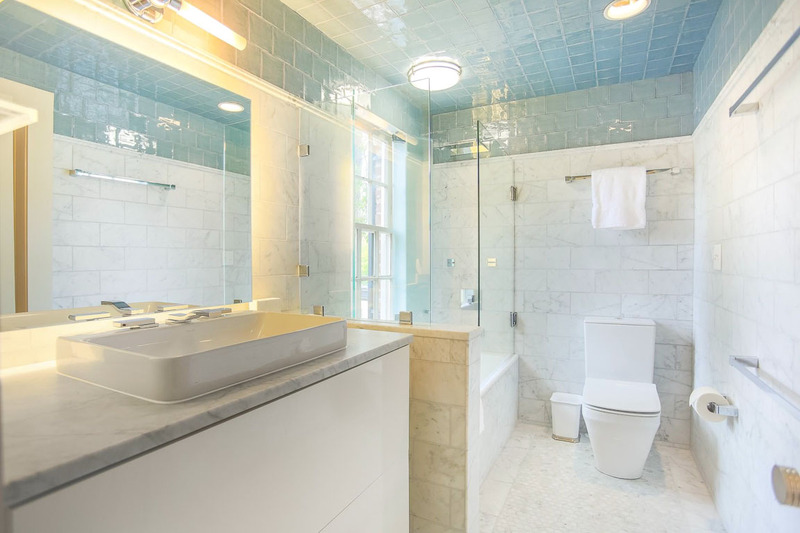 The master bathroom is great as well. And the bedroom is very spacious and full of light. It looks just like in the pictures! We wish we would've had more time to stay. We had the chance to meet the owner Suzanne and she was very nice. She talked to us about the history of the place. Overall we had a great stay. Timothy, thank you again for staying at Lamplight. 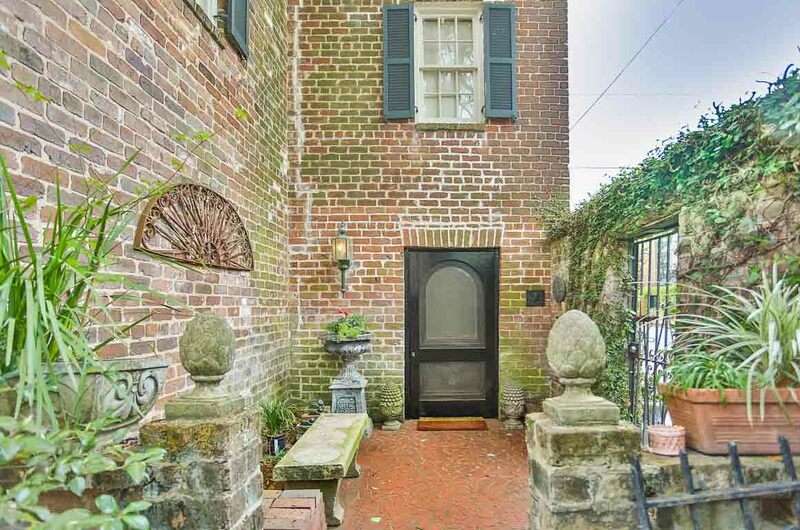 This home is truly a Savannah gem and we're so happy to hear that you learn of its history from the owner herself. We look forward to hosting you again soon! We loved this house. It is down the street from the grocery store, which was convenient, and within walking distance of everything (but Savannah is not that big). It was also nice that it's not next to a loud restaurant or bar. Comfortable beds and fantastic amenities in the kitchen and bathrooms. Hi Ronald! Thank you again for choosing to stay at Lamplight. We look forward to having you again soon. Can't wait to go back? Thanks again for staying with us, Adam! We loved the carriage house! My husband, baby and I had an amazing stay at the Carriage House. Great amenities, décor, and location! Able to walk all over downtown however located on a beautiful, quite street with ample street parking. Only downside is that we broke the key upon first entering. Apparently the front door is an antique and requires an extremely thin key, clearly prone to breaking. Be careful upon entering. Alison, thank you again for choosing Lucky Savannah for your family's vacation. 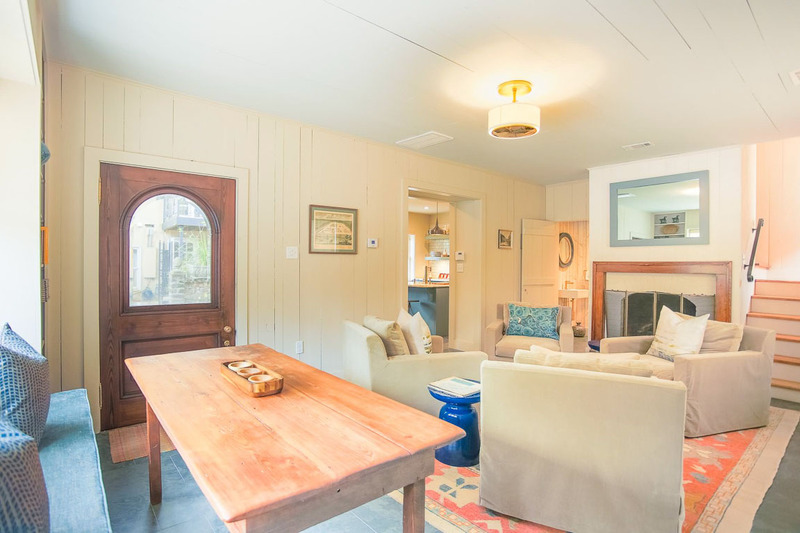 Lamplight Carriage House is indeed a beautiful place, and the antique door is part of the charm! We hope to have you again soon. The rental was impressive. We arrived and had no issues getting in or checking in with the helpful emails and application from Lucky Savannah. The rental was in perfect shape, lots of room, and right downtown. It was renovated on the inside, but still kept it's historical figure on the outside. We traveled from Tennessee and enjoyed the stay in Savannah as well as our rental. David, thank you again for booking with Lucky Savannah. We're so happy to hear that you were impressed with both the home and our seamless check in process. See you again soon! Loved the vacation rental...location...everything...just wish we had basic cable...missed all the Christmas movies! Valarie, thank you again for choosing Lucky Savannah! We're so happy to hear that you enjoyed Lamplight Carriage House and look forward to hosting you again soon! My husband and I go to Savannah about four times a year and this was one of the nicer homes that we have stayed at. It has recently been updated and is very clean and stocked with anything that you would need. The Nespresso coffee machine was a wonderful touch and, for me, much better than drip coffee. The home is located away from the busy streets so it is quiet without street noise when you're trying to sleep, which we have ran into often! The bed was very comfortable in the master bathroom was one of the larger ones that we've had. The master shower was a little tricky to learn how to work, but once we figured it out it was very nice. The only negative thing I would have to say about it is the street light outside (as stated in other reviews) of the master bedroom window was very bright, however we met to be sweet owner and she let us know that she is ordering some blackout curtains so that should not be a problem for future guests. When we met the owner we mentioned that we were down here for our one year wedding anniversary and she surprised us with a bottle of champagne and a sweet note, which we thought was the sweetest gesture. We would absolutely stay at this home again and highly recommend it! Rachel, thank you again for choosing to book with Lucky Savannah. Lamplight Carriage House is a true gem (along with the owner) and we're so happy to hear that you enjoyed your wedding anniversary in Savannah. See you again soon! We enjoyed celebrating our tenth anniversary at the Lamplight Carriage House. The home is beautiful, very clean, and comfortable. We did expect there to be a coffee maker, but there was only a Nescafé maker. Cleary's and J. Christopher's were within walking distance and made for a great breakfast/lunch spot. The home is in a perfect location, close enough to walk everywhere and located not on a busy street. We had to contact the management company the day we checked in because we had difficulty with the lock on the front door, I figured it out while on the phone with the rep. The front door is beautiful and has an old lock that is "finicky" but you'll figure it out quickly after a few times. I said the lock just added to the charm, it would be disappointing for such a beautiful home to have a generic looking door. I have to mention how much I loved the kitchen. 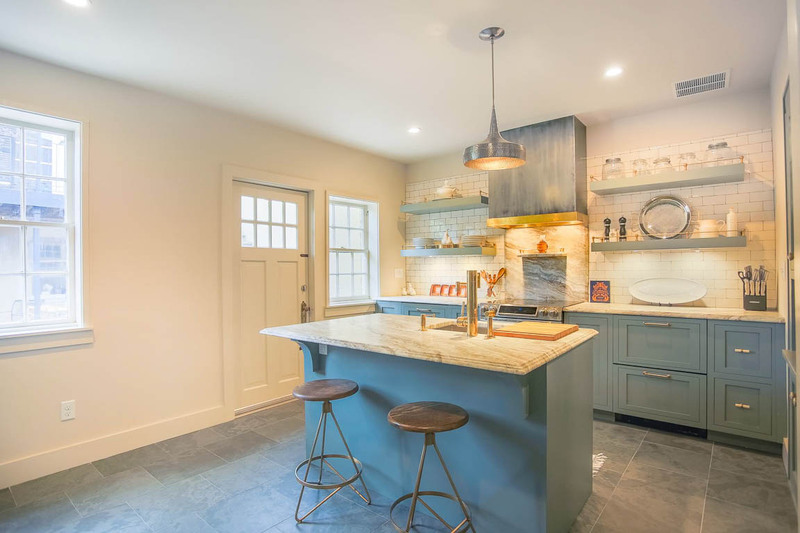 I didn't cook a thing while we were there, but I wanted to pack up the gorgeous counter tops and cabinetry, the kitchen is straight out of a magazine!! The bed was comfortable, the bathroom was so pretty. There's only basic cable, but we came to explore the city, not watch TV. The Cathedral of St. John the Baptist can be seen from the home and the steeples served as a great landmark as we walked around town. You should be sure to stop by the church, to say the sanctuary is breath-taking is an understatement. I look forward to returning to Savannah and the Lamplight Carriage House. Amy, thank you again for choosing Lucky Savannah! We're so happy to hear that your time spent at Lamplight Carriage House was cherished, and we look forward to hosting you again soon. House was accurately described and very comfortable. All the comforts of home. Would stay again without hesitation. We look forward to hosting you again soon, Christopher! Hi Gary! Thank you for choosing Lucky Savannah to host you in the Hostess City of the South! We are so glad that you enjoyed your stay and the perfection of the rental. We strive to offer the best in service and are so glad to hear that you received that from us! We hope to see you again soon! A great location which gave many points of interest within 10-15 minutes walking distance. Not to mention that the free city trolley route was only 2 blocks away. The property originally stated that a minimal amount of toiletry items would be available. But we had enough soap, shampoo and toilet paper for our 4 day stay. All kitchen cooking items were available and we really didn't need anything. We could have had a little more coffee, but we did have enough for our stay and appreciate it being available for us. The property does have two thermostats which kind of fought against each other until we figured out... turn one off, and operated the one on the floor you will be occupying. It did keep it either a little to hot or a little to cold, but the system regulated the air rather quickly. The only other item I would highly recommend they look into, is the front gate and front door. The gate could be leveled and squared. Trying to close and open it would be a tug or push of war to lock or unlock. Same with the front door. I know if I lived here on a constant basis, I would NOT struggle with this day after day. The tv had only 5 or 6 local channels, but this didn't bother us, for we are not big tv watchers. All in all, we would definitely stay here again. And we just might. Linda, thank you for choosing Lucky Savannah! We're so happy to hear that you enjoyed your time at Lamplight Carriage House, and look forward to hosting you again soon! Great little place to use as 'base camp'. Roomy enough for two, but still cozy. 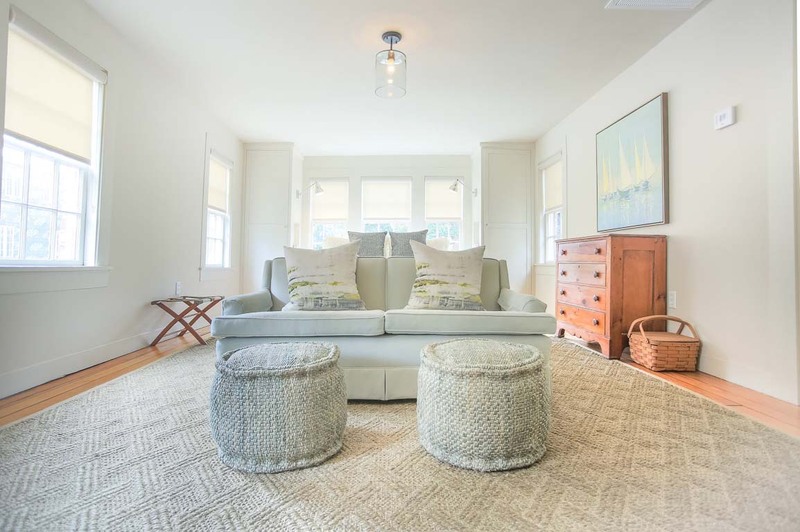 Situated in a great neighborhood that is quintessential Savannah, yet close enough to town to walk. My family and I had the extreme pleasure of staying in this gorgeous converted carriage house on our first vacation to Savannah. We completely fell in love with the city, but the accommodations actually had us all saying we needed to make this an annual trip for our family. The home was luxurious beyond measure. A completely modern Chef's kitchen, a warm and inviting living area with the most comfortable chairs imaginable. Upstairs were 2 bedrooms. My daughter adored that there was a TV in "her" bedroom (it's the only tv in the house). We do our best to limit tv while on vacation because exploring is where we put our emphasis! The master bedroom was huge and featured a comfy king size bed and plenty of pillows. There was also a little couch in the master which our daughter loved hanging out on when we got ready in the morning. The bathroom was amazing. All hand laid tile, and upgraded faucets that quite impressed our 6year old! Powerful air conditioning was divine as we visited in the heat of June, making a welcoming return at the end of our days. This home was right in the heart of the historic district which allowed us to walk easily to everything despite the heat and humidity. In fact, the only day we used our car was the day we took a little day trip up to Charleston. We ordered delivery from a pizza place one night...I wish I could recall the name now, but they had the very best spaghetti I ever ate besides my own moms. I would not only recommend this peice of heaven to everyone visiting Savannah, but I am willing to change our next years travel dates just to book this gem once again! Thank you for choosing to stay with Lucky Savannah! This home does have a very luxurious and comfortable feel. 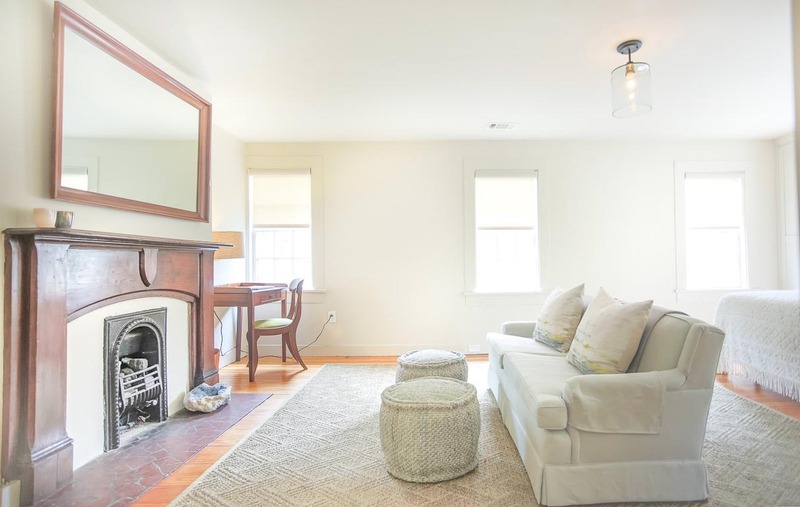 If you do visit the Lamplight Carriage House again in the future, you’ll be pleased to know that the fireplace mirror in the Living Room is actually a tv as well! We can't wait to have you all again, and please don't forget about our 10% "Returning Guest" discount! The Charlton is a great place to stay! Great location, walking distance to all the action! The house is beautifully redone, well stocked kitchen, comfy bed, great bathroom! We did not have designated parking, but that was never a problem. We thoroughly enjoyed our stay in historic Savannah! We will be back! Only odd thing, and it may sound petty, but on our check out day, they cut the cable & wifi off. My husband was going to watch tv while I finished getting ready, but no cable. The picture is from the road in front of the house! Over all our stay was amazing! We will be back!